Shawn's Bicycle Adventures: Sidewalk Cycling: to Ride or Not to Ride? 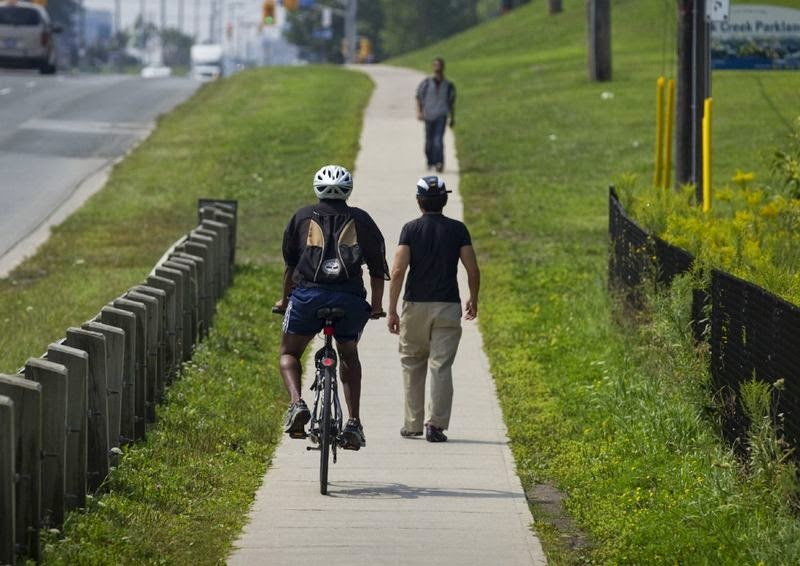 "Traffic laws in Ontario do not specifically prohibit riding on sidewalks. 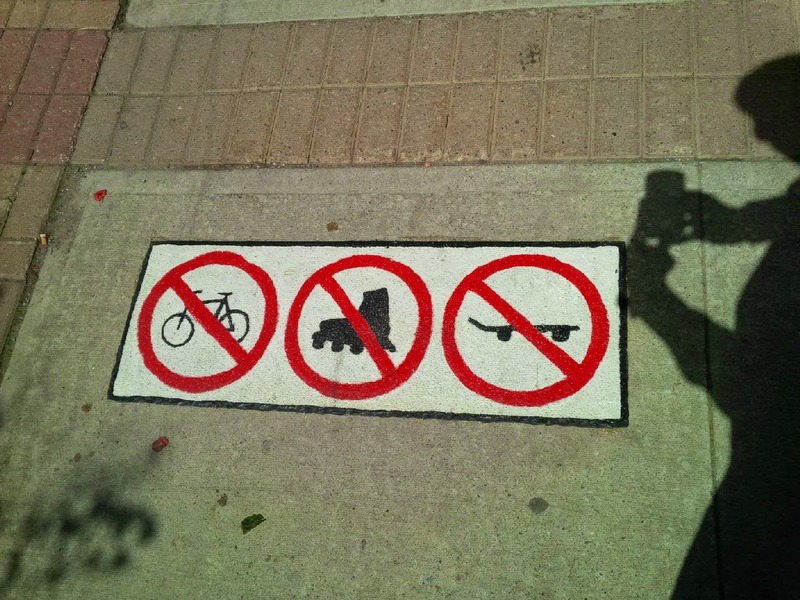 Restrictions on cycling on sidewalks can be regulated by municipal by-laws." In 2014, the City of Toronto amended it's bylaw to state that no person age 14 and older (rather than based on wheel size) may ride a bicycle on a sidewalk. The fine for an adult who rides a bicycle on a sidewalk shall be $60. 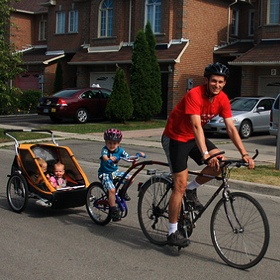 The intent of this bylaw is to allow young children to cycle on the sidewalk while they learn to ride. “Bicycle” includes tricycle or unicycle with a wheel or wheels of more than 24 inches in diameter. 15) No person shall ride a bicycle with a wheel or wheels more than 24 inches in diameter upon a sidewalk on any road. “Bicycle” includes a tricycle having a wheel or wheels of more than 60 centimetres in diameter. “Bicycle includes a tricycle having a wheel or wheels of more than 60 centimetres in diameter. “Bicycle” includes a two or three wheeled non-motorized vehicle having wheels of more than 60 centimetres in diameter. “Bicycle” includes a tricycle and unicycle but does not include a motor assisted bicycle. “Bicycle” includes a tricycle having a wheel or wheels or more than 60 centimeters in diameter. “Bicycle” is a device propelled solely by human power, upon which a person may ride either on or astride a regular seat attached thereto, including a tricycle and unicycle, but excluding children’s bicycles or toy vehicle. 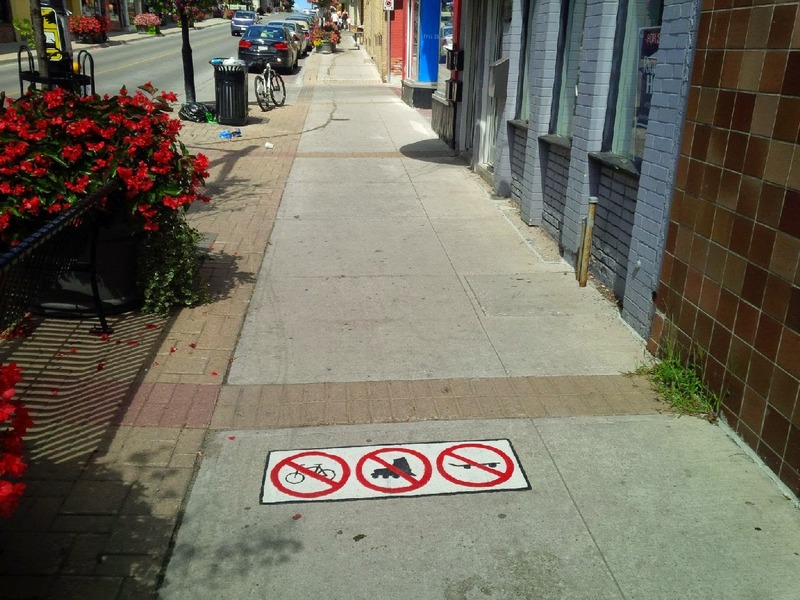 Main Street in Newmarket has specific pavement markings clearly indicating no sidewalk cycling. This makes sense because of the pedestrian activity, and the number of store entrances right next to the sidewalk makes it hazardous if cyclists and pedestrians were mixed. The problem with sidewalk cycling as I see it is the risky behaviour of some cyclists. Here's an example at the Dufferin/407 interchange in Vaughan. The sidewalk cyclist is riding against traffic, does not slow down at the intersection, and does not have a bike light. To make matters worse, the sight lines for right-turning motorists coming off the ramp are restricted by the guiderail and bridge. These drivers will be looking the opposite way to see if it's clear to turn, and may barely slow down. The cyclist was lucky this time around, but it will catch up with him eventually. Advocate for better cycling facilities. In the mean time, if you do choose to ride on the sidewalk because it's the best option, ride smart!